"Put on your bathing suit, we're going swimming! 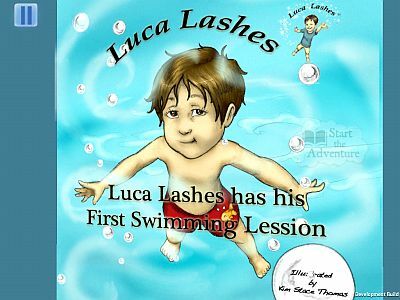 Kids learn how to hit the pool with confidence in "Luca Lashes has his First Swimming Lesson." This is a multilingual (English, French, Italian, Spanish, and coming soon Chinese), educational and interactive audio app and continues the Luca Lashes series about children's first experiences. In this app, Luca Lashes, the Boy with the Magical Eyelashes, discovers the joys of the pool with his daddy. Children can experience a swimming lesson interactively though touch, sight, and sound. The story includes a list of parent suggestions, including common swimming pool rules and other ideas to help prepare children for their first swim. It never hurts to have one more tool before your child steps into the water." * It is engaging and interactive and I love that we can also touch the page on the screen and the page sways according to your direction you sways it! 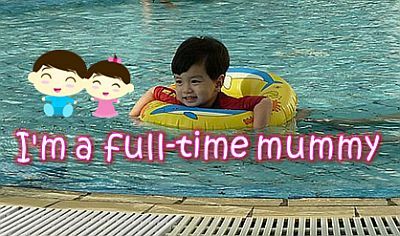 * I like the storyline where it tells how Luca experienced his first swimming lesson and gain confidence to be in the swimming pool. * I like the page where daddy guides and holds Luca during his swimming lesson as I think my boy can totally relate himself to Luca since hubby is mostly the person being in the water more often compared to me as I don't know how to swim. I understand it is the character's 'power' to gain confidence and be brave by blinking his eyelashes twice but for me, I decided not to stress on this to my boy (compared to other pages, I will normally repeat and explain again to my boy) as I don't want him to be blinking at things. Maybe it's just my weird preferance but other than this, I think this book is a great start if you want to introduce the idea of swimming to your little ones. You can purchase the " Luca Lashes has his First Swimming Lesson " app from the iTunes App Store. I received no monetary compensation for this review, I was provided with the promo code to redeem the application for free from iTunes Store in order to facilitate my review. All opinions expressed in this post are my own. Please do your own research when purchasing products, as your opinions may differ from mine. And if you'd like to read my previous iPad Apps reviews, you can do so by reading this post of mine called "My iPad App Reviews"
iPad App Review - Luca Lashes and His First Trip to the DentistSharing our review of the "Luca Lashes and His First Trip to the Dentist" app!iPad App Review - Luca Lashes and His First HaircutSharing our review of the "Luca Lashes and His First Haircut"!iPad App Review & Giveaway - OrganiDoc HDSharing my review of the awesome OrganiDoc HD iPad app!